When blisters are your enemy, you get picky about your socks. For walking, it's wise to convert from cotton socks to socks made of CoolMax or acrylic blends, or socks with a blend of wool and those fibers. These high-tech fabrics wick the sweat away from the foot and help prevent blisters. Sweat softens your skin and makes it more prone to blisters when your foot rubs against your shoes. This friction can tear softer skin. A sock that keeps your foot drier thus helps prevent blisters. The US military adopted a sock made of a blend of wool, polypropylene, ​and acrylamide, which proved better at wicking away moisture for six-mile marches. Contoured for Your Foot Shape: Socks need to be shaped like your foot so they don't bunch up and create friction points where blisters can develop. Old-school tube socks are not shaped like your foot. 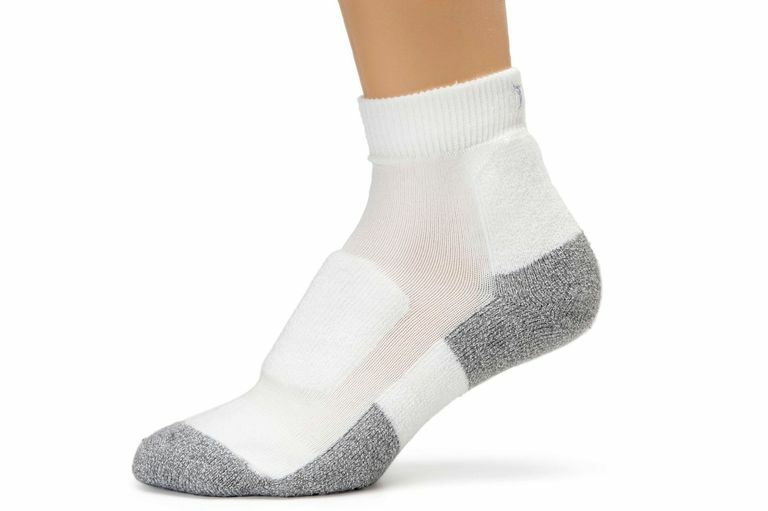 Look for socks designed for walking that conform to your foot shape, such as Thorlo walking socks. Male vs. Female: Socks There are general anatomic differences between the adult male foot and the adult female foot. A performance sock will be made for each gender. That's not to say your foot is typical, but it is a good place to start. You want a sock that fits your foot shape well so it doesn't bunch up and cause a blister to form. Padding and Thickness: In general you don't need a thickly padded sock for walking as your feet take less of an impact than with running or playing sports such as basketball. More padding can mean that more moisture gets trapped before it is released. Your feet will swell as you walk and thick socks can mean less room for your feet to expand, leaving cramped toes prone to blisters. A sock that is too thin can also contribute to forming blisters. Look for a medium thickness or light padding. Double-Layer Socks: Double-layer socks prevent blisters by wicking moisture from the inner layer to the outer layer and decreasing friction. According to Wrightsock "This movement between the two layers of the sock replaces what would be movement between your foot and an ordinary sock. By allowing this movement within the sock layers, the friction is absorbed and the foot receives much less, if any, friction." These mimic the classic hiking tactic of wearing an inner polypropylene sock and an outer wool sock with boots. Cuff Height: You can find running socks in a variety of cuff heights from invisible to mini-crew to crew and knee high. Choose the kind you like best or vary them so you don't get tan lines around the ankle. One disadvantage of invisible ones is that they may end up sliding down your foot and bunching. Style: Do white socks bore you? Visit your local running store and see the variety of technical socks with jazzy designs and colors. There are more and more of them available. Reflective for Safety: Look for styles that have reflective designs around the cuff for added safety when walking at night, assuming you are wearing shorts or capris so they could be seen. Three-packs of running socks are common at most running stores. If you want to go with the more expensive brands, comparison shop online. Knapik JJ. "Prevention of foot blisters." J Spec Oper Med. 2014 Summer;14(2):95-7. Bogerd CP, Niedermann R, Brühwiler PA, Rossi RM. "The effect of two sock fabrics on perception and physiological parameters associated with blister incidence: a field study." Ann Occup Hyg. 2012 May;56(4):481-8. doi: 10.1093/annhyg/mer127. Epub 2012 Jan 23.